Not much of a game Saturday afternoon when Georgetown played Drexel. So I decided to try to move around to some non-traditional spots. First I squeezed between a media table and some courtside seats and tried to get some shots there. It wasn't long before some guy in a suit told me to move, so I went way up into the stands. I also utilized some slow shutter speed. Shout out to important guys in suits. 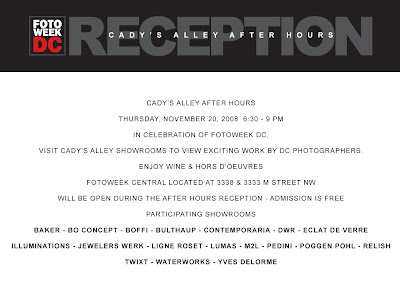 FotoWeek DC has been going on here since its kickoff last Saturday. Tonight, your boy will have some work on display at Contemporaria in Georgetown tonight (Nov.20, 2008) from 6:30pm-9:00pm. Contemporaria is located one block south of M Street in Georgetown on the corner of 33rd Street and Cady's Alley. Stop by if you've got the time. I thought this was the year. I thought this was the year my Coolidge Colts (yes, MY) were going to the Turkey Bowl and taking the championship to 5th St. The third time was supposed to be the charm. This year, this season, I thought that I would have the privilege of photographing high school football on Thanksgiving morning before I jetted off to visit my girlfriend and her family. But now I feel like the Chicago Cubs...wait 'til next year. Every practice I attend, every game I photograph and every halftime speech that I've clicked the shutter through has made me more and more partial to the orange, gray (allegedly) and white. Last Saturday, for the second year in a row, Coolidge fell to HD Woodson in the semi final. 30-24, bad guys. To Emanuel Yeager, Derrell Person, Dewayne Jones, Tisean Redmon, Kwaizi Butler, Waaiz Bell, Mark Whitehead, Donald Stewart, Irvin Proctor, Aaron Wallace, Tim Sunkins and Dana Rhea, it's been real and best of luck to you after graduation. But to everyone else, we still got next year. Shout out to the 2008 Coolidge Colts. Again, we're reaching the end of the high school football season. In this Washington Catholic Athletic Conference (WCAC) match-up, St. John's (already in the playoffs) played Gonzaga (needed to win to get in). Unfortunately, Gonzaga took the L, but at least they won the soccer championship. The game was held at Blair High School in Silver Spring, MD as St. John's has played all away games this year while their new field was being constructed. More game coverage here. Last week I photographed friend and hip hop artist Broadway Miller for his upcoming project called "Catch Up or get Caught". We went down to the SW Waterfront where there was a lone fisherman and a bucket of about three 20-30 pound catfish taking their last breath. It's been a long time since Broadway and I last collaborated, but not much has changed. He's still making music, I'm still taking pictures. Both are still waiting to stack real money to the ceiling. Last Friday, the Coolidge Colts played their last regular season game against the Cardozo Clerks. As the playoffs get closer, the team gets more and more excited about finally getting that chance to play on Thanksgiving Day in the DCIAA championship dubbed, The Turkey Bowl. Only because I don't usually shoot girls high school sports. But this championship occurred on the same day and field as the boys championship, so why not. I don't know much about the two teams (St. John's and O'Connell) but the fans were crazy. St. John's, ranked #1 throughout the season, took home the title with a 2-1 victory. For a more thorough explanation go here. I've kind of been following this team a lot this season. Partly because of talent but mostly because of proximity. For example, Good Counsel's football team is ranked #1 in the area (DC, Maryland, Virginia) by the Washington Post, but you won't catch me out in Olney, MD. Okay, you might. Anyway, Gonzaga plays great soccer and this past weekend I photographed their championship game. I was hoping for a Gonzaga vs. DeMatha three-match, but got O'Connell instead. Shout out to all of the parents that ordered pictures from me throughout the season. Last Friday, I spent most of Halloween with the (very orange and black) Colts from Coolidge High School. They had a big game against perpetual rival Dunbar High School, with the winner being the DCIAA West regular season champion. Unfortunately, the Colts lost 34-27. As usual I spent a lot of time "behind the scenes". The Colts season with a game against Cardozo High School and playoffs thereafter. Shout out to my man with the orange and black high top Nike Dunks (below). They had bats on them.